Participants of all race distances must be at least 18 years of age on race day. Age is calculated by 2019 minus your birth year. Race briefing is on Friday 25th January 2019 at the race venue, and is MANDATORY for 100km, 75km, and 50km runners to attend. Runner need to check-in with the bib number. In case of non-attendance, runners will receive a time penalty of 30 minutes. 17:30 - 18:30 English language briefing. 18:30 - 19:00 Thai language briefing. Runner must stay on the marked course. Shortcuts are not permitted. If you get lost, please return to the last sighted marking. If first aid assistance is needed on the course, call the phone numbers listed at the back of the provide course map from the race kit. Transportation will be arranged to retrieve you. Outside assistance from friends & family members is only permitted at the check points. No support is allowed on the course at any time. This can lead to disqualification of the runner. For 75km and 100km runners, there will be a gear check at checkpoint 5 to ensure runner is still carrying sufficient hydration. Runner without the necessary hydration will be disqualified. Mandatory gear must be carried at all times during the race. 50km, 75km and 100km runners will be check randomly throughout the race. Failure to comply can lead to a time penalty or disqualification based on the severity of the breach. Please ensure the timing chip is attached to the ankle and checked at every checkpoint to record your time; by running pass all the chip-timing system mats. Otherwise problems will occur with your time result, which may lead to disqualification. Running with a bib number that does not belong to you or running the distance you did not registered will lead to disqualification. If you choose to withdraw from the race, inform the nearest staff in the area. Transportation will be arranged to pick you up and drop off at the race venue. Please ensure your timing chip is return at the race venue. Runner must obey all directions from the course marshals and race organizer. Violation of the rules will incur a time penalty or disqualification. Any such penalty is at the organizer's discretion and is final. Runner, who wishes to protest against unfair judgment from any referee or protest against other runners, will have to summit a letter of request to the competition committee within 30 minutes after the race is finished, or after withdrawing from the race, and pay a protest fee of THB 1,000. The fee will only be refunded if the request is success. The race director’s decision is final and cannot be appealed. 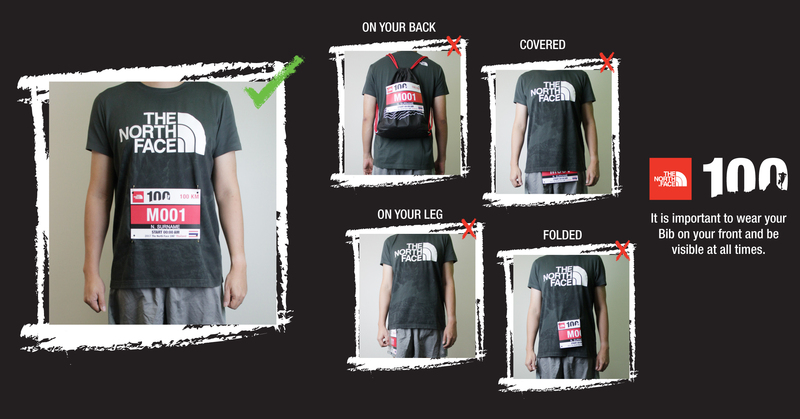 Any participants’ misconduct during the protest procedure may lead to expulsion from future The North Face 100® Thailand races.